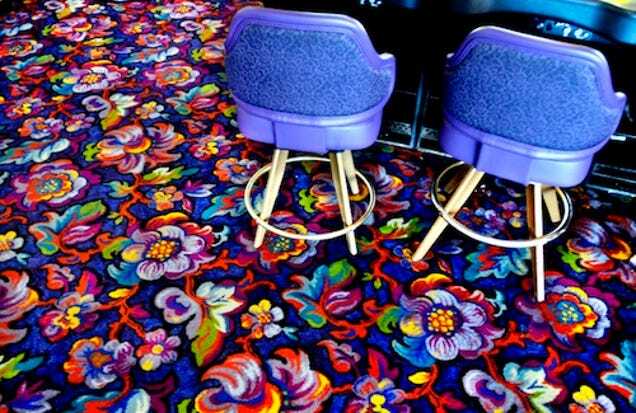 Why are casino carpets so damn ugly? Going to the casino is great fun, whether you are there to play on the traditional table games or take on the challenge of the slots. Sure, you can experience those great games online with us at Lucky Nugget Casino, however, another factor going for the casino is that you can dress up. For the men, tuxedos, and your best 007 impression. For the women, it’s elegant dresses that make you feel a million dollars. All this sounds great, so how come when you go to the casino the carpets are so bad!? Okay, it might not be the most pressing issue out there, but we reckon you’ve all noticed the hideous carpets, and here we will look at why this is. There are a lot of theories surrounding the casino, that they do a lot to keep you in there, active and ready to gamble. Of course, that makes sense from their part, and the fact there are no windows and clocks in casinos further supports that, as they don’t want anything to distract you from your gaming. So, to keep you focused further, the snazzy designs, bright colours and outrageous carpets could just be playing their own part. As well as that, it can keep you excited and ready for fun. That’s the whole point of the casino – entertainment, so having dull, boring carpets wouldn’t exactly fit in, would it? This is pretty much a certainty as to why casinos have these carpets, because with thousands of people walking on them every day, they are bound to suffer from general wear and tear more than usual, and it will be less noticeable in a strange design. Similarly, amidst all the excitement and entertainment, people may spill their food and drink. We are all a bit clumsy after a few drinks, aren’t we? So, imagine if you have hundreds, or thousands of people in that situation, we imagine it can get very messy on the floor, and what better way to hide that than a fancy carpet. As mentioned, the casino is about entertainment, and in some cases, entertaining designs might come across as wacky. However, if the walls and all the other decorations are snazzy and different then it’s inevitable that the carpet will also have to be. That’s all it is in some situations, just fitting in to the surroundings. But… Don’t believe the myths! As with all casino talk, there are a lot of myths that get passed on. In the case with the carpets it’s that the design would somehow force you to not look on the floor and instead look straight ahead to the slots and tables, which would attract you to them. Unfortunately, that’s not true. So, there you go, some logic to the wacky designs that you might find at the casino. They’re certainly memorable anyway, and any of these reasons could apply, although we certainly think that the practical element makes the most sense.